These are eggless saffron and cardamom flavored cookies which will just melt in your mouth. The pic was sent to me by Arunima Chatterjee and the recipe is mine from my cooking page on facebook. Thank you so much Arunima 🙂 She used the saffron she bought from me and look at the amazing color!! cream butter with saffron and sugar. add the white flour and the ground cardamom powder vanilla and mix all well. add a bit of milk and baking powder, mix all verry well. it should be a nice pliable lovely smelling dough. 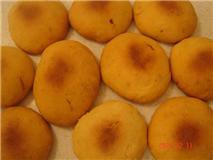 This entry was posted in Eggless Sweet Temptations, Floury Matter, Saffron and tagged cookies, eggless cookies, saffron. Bookmark the permalink.